In this paper we present the results of the study of 32 projectile points from Hangar site, located in the Salado creek basin (centre of the province of Buenos Aires). Archaeological materials recovered from the site include some isolated human remains, several potsherds, faunal materials, and lithic artefacts. The presence of pottery and small triangular points, together with the radiocarbon dating results, indicate that the main occupations occurred during the end of the Late Holocene. Methodology used included the techno-typological study of the lithic assemblage. Results showed that the outcrops of some rocks present in the sample are found in the Humid Pampas (100-190 km distant from the site) and the Dry Pampas (400-530 km distant from the site). The projectile points show variability in design and size, attributes that have implications for distinguishing different weapon systems (e.g., arrow and dart). In the Pampas region, the Late Holocene is a period characterized by an increasing complexity in hunter-gatherer societies, as it is indicated by long-distance exchange networks and different strategies of intensification and diversification on faunal resources. In accordance with this scenario, we propose that the variability that is observed in the lithic points is a reflex of an increase in the amount of the hunted species in relation with technological innovations such as the introduction of the bow and arrow. Bayón, C. & Zavala, C. 1997, Coastal Sites in South Buenos Aires: A review of Piedras Quebradas. In: Quaternary of South America and Antarctic Peninsula, Vol. 10 (Rabassa, J. & Salemme, M., Eds. ), A. A. Balkema, Bookfield, Rotterdam: p. 229-253. 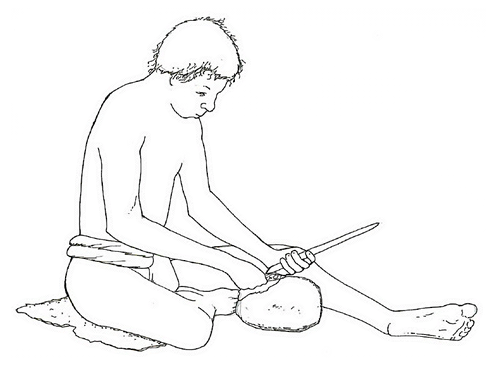 Crabtree, D.E., 1972, An Introduction to Flintworking. Occasional Papers of the Idaho University Museum No. 28, Idaho State University Museum, Pocatello, 98 p.
Crivelli Montero, E. Eugenio, E., Pardiñas, U. & Silveira, M. 1997, Archaeological Investigation in the Plains of the Province of Buenos Aires, Llanura Interserrana Bonaerense. In: Quaternary of South America and Antarctic Peninsula, Vol. 10 (Rabassa, J. & Salemme, M., Eds. ), A. A. Balkema, Bookfield, Rotterdam: p. 167-209. Ericson, J. 1984, Toward the Analysis of Lithic Production Systems. In: Prehistoric Quarries and Lithic Production (Ericson, J. & Purdy, B.A, Eds. ), Cambridge University Press, Cambridge: p. 1-9. Franco, N. 2014, Lithic artifacts and the information about human utilization of large areas. In: Artefactos Líticos, Movilidad y Funcionalidad de Sitios: Problemas y Perspectivas (Escola, P. & Hocsman, S., Eds. ), BAR international series Vol. 2628, British Archaeological Reports, Oxford: p. 116-127. Nelson, M. 1997, Projectile Points: Form, Function and Design. In: Projectile Technology (Knetch, H., Ed. ), Interdisciplinary Contributions to Archaeology, Plenum Press, New York: p. 371-384.